Triathlete Javier Gomez has pulled out of the Rio Olympics after breaking his elbow in a cycling accident. Gomez, 33, was considered the main rival to Yorkshire brothers Alistair and Jonny Brownlee, splitting the pair to claim silver at London 2012. 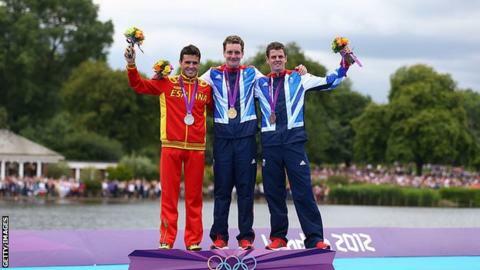 The Spaniard has won three consecutive International Triathlon Union World Championship titles, and five overall. Revealing the injury on Facebook, Gomez wrote: "I will keep fighting, I have many goals, I'm not done yet." British Triathlon performance director Brendan Purcell described the fact Gomez will not challenge the Brownlees in Rio as "terrible news". "Javier is such a talented athlete and you want the best athletes to be racing on the biggest stage of all," he said. "While Javier is perhaps the biggest threat and rival to Alistair and Jonathan Brownlee's prospects, his presence would also be an asset." Gomez, who was born in Switzerland, said he was "disappointed" but "realistic" over his chances of recovery from an injury caused by a "silly crash". "There is no time to prepare and to be fit on the start line of the Games," he said. "The most sensible thing is to open my spot and allow someone else the chance to race."